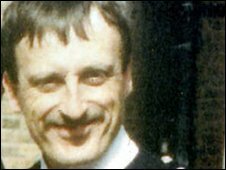 A man has been arrested on suspicion of murdering the police constable Keith Blakelock in north London 25 years ago. He was hacked to death on 6 October 1985 during the Broadwater Farm Riots in Tottenham. Winston Silcott was among three men wrongly convicted of murder. A man, originally from Tottenham, was held on Friday and questioned at Bury St Edmunds police station. Police described the arrest as "significant". The suspect, 40, detained in Suffolk, was bailed on Tuesday until May. The Metropolitan Police have appealed for information about the murder of 40-year-old Pc Blakelock, or the attempted murder of Pc Richard Coombes who was attacked on the same night. Silcott, Mark Braithwaite and Engin Raghip were convicted of Pc Blakelock's murder in July 1987 but cleared on appeal in 1991. Pc Blakelock, a father of three who was originally from Sunderland, was murdered by a machete-wielding gang during the riots, which involved about 500 youths who rampaged through the Broadwater Farm estate. The riots, in which gangs attacked police, looted and set fires, were some of the worst the capital had seen for decades. The officer and his colleague Pc Coombes were attacked as they tried to protect firefighters as violence escalated. The unrest was sparked by the death of Cynthia Jarrett, 49, who collapsed during a police raid on her home. In 2005, police released images of Pc Blakelock's blood-stained overalls, with tape marks outlining the number of wounds inflicted upon him. Investigators have repeatedly said people in the area have information about the identity of the killers they have not shared with police.